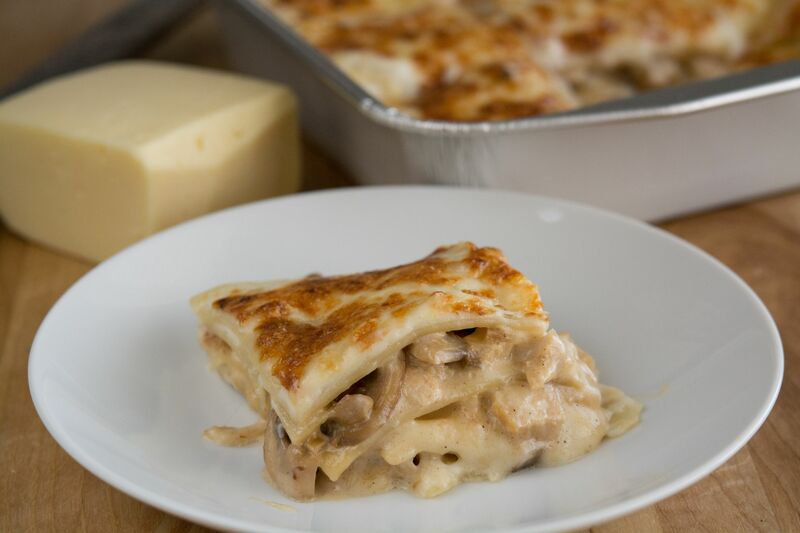 Chicken lasagna is one of those recipes that I never saw in Colombia when I was a girl, mainly because it was not very well known at the time. It became more popular many years later and of course, it’s one of those recipes that people are constantly asking me to make, especially after I posted the recipe for lasagna with meat sauce. Here in the US we make somewhat of a different version because we usually use cream of mushroom soup and also other vegetables, like broccoli or even spinach. But the version that they tend to make in Colombia is more simple and in my opinion way better because they add lots of mushrooms, which I love, and put it together with white sauce or bechamel sauce. So you can just imagine the wonderful flavor it gets from all of those ingredients. 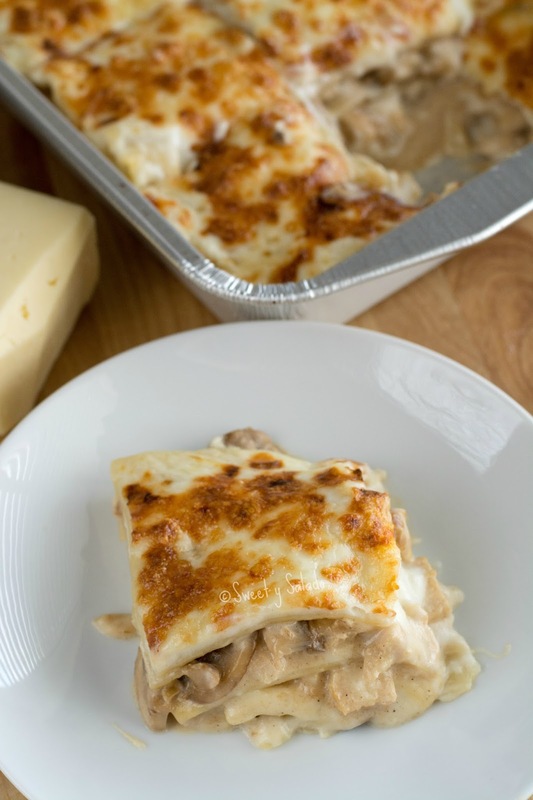 This recipe yields one big lasagna that you can bake in a 9 x 13 inch (23 x 33 cm) baking pan or for two small lasagnas made in 8 x 8 inch (20 x 20 cm) baking pans. Since there’s not that many people in my household and some (my husband) are not too crazy about pasta (total craziness), I always end up making two small lasagnas. I bake one in the oven as soon as I assemble it and the other I assemble in a disposable pan, wrap it well with plastic wrap and aluminum foil and then freeze it until we feel like having it again. It makes life so simple! Cook the lasagna noodles according to the instructions on the package. Drain and leave them soaking in cold water to avoid sticking. Drain right before using. Season both sides of the chicken breasts with salt and pepper. Heat 2 tbsp of oil in a large pan over medium high heat and cook the chicken for 5-7 minutes. Lower the heat to medium, flip the chicken over and cook for another 5-7 minutes or until it is no longer pink. Remove from the pan, let it cool and chop it into small pieces. Clean the mushrooms well and cut them into thin slices. Heat 1 tbsp of oil over medium heat in the same pan that was used to cook the chicken. Add the white onion and cook for 3-5 minutes or until it is translucent. Add the garlic and cook for another minute. Now add the sliced mushrooms, season with salt and pepper and cook until they are soft, about 5-8 minutes. Add heavy cream, stir well and cook for another two minutes. Check for seasoning, remove from the heat and set aside. SAUCE: Melt the stick of butter in a medium saucepan over medium low heat. Add the flour and mix well until it turns into a golden yellow color, this can take between 7-8 minutes. Slowly add the cold milk while constantly whisking. (I have always made it with cold milk and never stop whisking with wonderful results). Keep whisking until it is smooth. Bring it to a boil and cook for about 10 minutes. Remove from the heat and season with the nutmeg and salt and pepper to taste. Set aside. Pre-heat oven at 375ºF (190ºC). ASSEMBLE: Cover the bottom of the baking pan with cooking spray or a little bit of oil. Spread about 2-3 tbsp of white sauce on the bottom. Top sauce with 3-5 lasagna noodles (depending on the size of your baking pan). Spread 1/3 of white sauce over the noodles. Add ½ amount of chopped chicken. Add ½ the amount of cooked mushrooms. Sprinkle 1/3 the amount of mozzarella cheese. 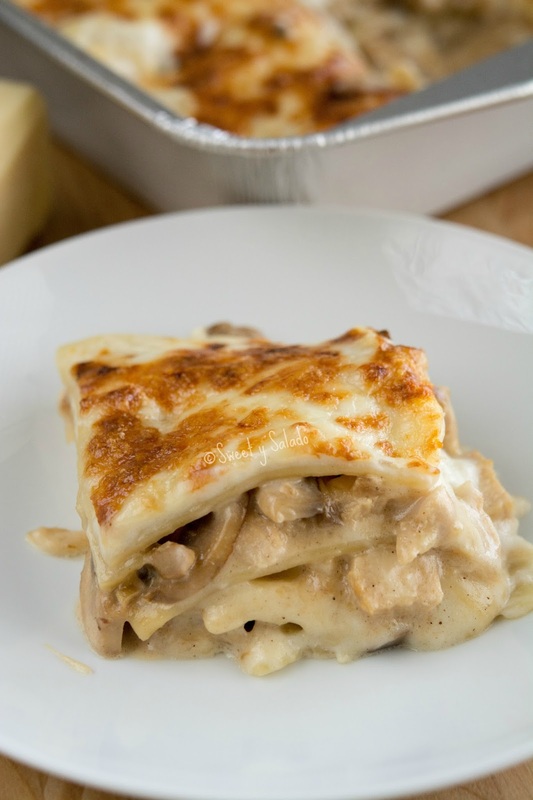 Repeat with a layer or noodles, white sauce, chicken, mushrooms and 1/3 mozzarella cheese. Finish with a layer of noodles, white sauce, the last 1/3 of mozzarella and the Parmesan cheese. 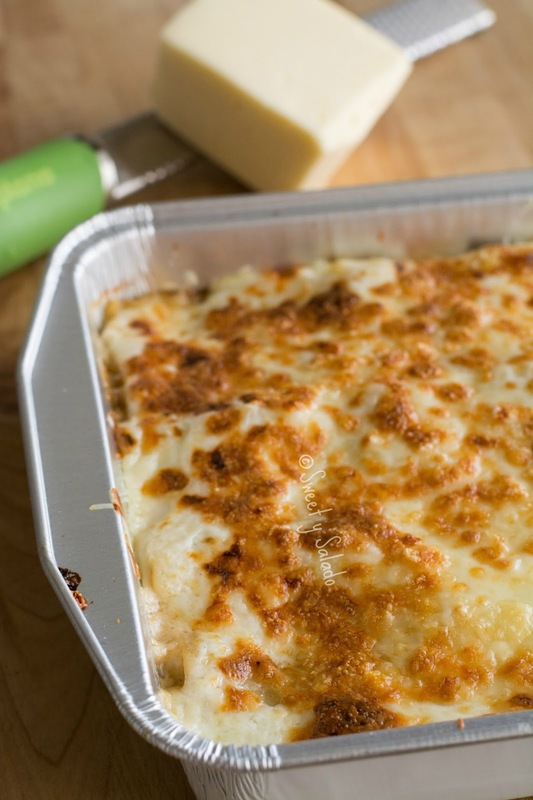 Cover the lasagna with nonstick aluminum foil or spray regular aluminum foil with cooking spray. Place it on a cooking sheet and bake it for 20-25 minutes. Remove the aluminum foil and bake for another 15-20 minutes or until the cheese melts on top. Let it set for about 15-20 minutes before serving. To freeze the lasagna you can cover it tightly with plastic wrap and aluminum foil. To cook it you can thaw it in the refrigerator overnight. Remove the plastic wrap, replace the foil and bake as instructed. Baking may take 10-15 minutes longer. Bake it for about 1 to 1½ hour if it is still frozen.